Industrial, heavy duty rectifier, designed for all applications requiring DC power supply. The IRC is a robust and reliable industrial rectifier, designed to supply critical DC loads and to charge any type of battery. This product is the result of 40 years of experience in design and production of Power Source Equipment. The IRC is based on standardized SCR and IGBT power conversion systems, to provide superior reliability, efficiency and cost effectiveness. These systems are available in different types of enclosures, with protection ratings up to IP54 or NEMA 3R. The control boards are based on microprocessors of the latest generation, equipped with alphanumeric and mimic display panels, integrated data-loggers and a complete set of connectivity options (RS-232, RS-485, USB, CANBUS, Wireless). These IRC chargers can be equipped with a wide set of optional features, such as breakers, distribution panels, remote communication and alarm systems, dropping diodes. A team of designers and field-application engineers is dedicated to support our Customers if they have special requirements. This type of support makes Amperis a unique partner for demanding Customers and mission critical applications. Do you want to buy high quality DC Industrial Power Sources – Industrial Rectifiers? 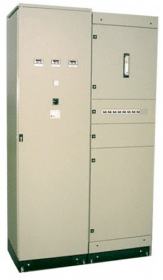 Inquire for our DC Industrial Power Sources – Industrial Rectifiers prices.